Drivers are still exceeding 20mph limits in residential and urban areas. Four in ten drivers said they sometimes break the limit by at least 10mph in zones that are designed to keep pedestrians, particularly children and the elderly, safe. The findings come from a new survey carried out by Brake - the road safety charity - and insurance firm Direct Line. The statistics make for concerning reading in the week when most children are going back to, or starting school, for the new term. In 2014 a total of 53 children under the age of 16 were killed and more than 2000 seriously injured on our roads, the majority being on foot or bicycle. So does exceeding the 20mph limit make that much difference to safety? The answer is a resounding yes. Research shows that if a child runs into the road three car lengths ahead, a driver travelling at 30mph will not be able to stop in time and will still be travelling at 28mph when they hit the child. But a driver travelling at 20mph should just be able to stop in time, providing they are paying attention, have well-maintained brakes and are driving in dry conditions. It's something many drivers are aware of and yet more than a quarter of drivers surveyed say they exceed a 20mph limit at least once a month and over one in five admit to driving much faster than the 20mph speed limit on a weekly basis. A trial of 20mph limits in Warrington, Cheshire found pedestrian and cyclist casualties dropped by 36% while a study of 75 different 20pmh limit locations in Scotland found casualties dropped by 42%. And if you need convincing why 20mph zones are there for a reason, Tommy Kenny was just 10 years old when he was tragically knocked down and killed on a pedestrian crossing on a 30mph road in London. The little boy was thrown 60ft on impact, leaving him with multiple traumatic injuries so severe that he stood no chance of survival. The police investigator said that the driver was doing between 30-39mph when he hit Tommy. If the limit had been set to 20mph rather than 30mph, Tommy might still be here today. His aunt sums it up perfectly. "Tommy was a much loved son, brother, grandson, nephew and cousin with the best years of his life ahead of him. Our lives fell apart when he died and he is missed hugely by his whole family. We all need to slow down, and we can all do that today. One can only imagine what pain Tommy's parents, Lynsey and Lloyd, have gone through and will do for the rest of their lives." I live on a 20 zone road, the problem with this one and all others is they are never enforced, in fact regional forces stated they would enforce them. Last year a government statement said they should be enforced but nothing has happened and our Norfolk constabulary still states it wont enforce them. Which begs the question , what is the point of instigating them in the first place. The second problem is that because of the total lack of any effort to implement any speeding curbs in 20 zones and the fact that all drivers/riders know it they are abused in a way even 30 zones would not be, to a degree that on some occasions beggars belief. In the past I had a brief motor sport period and worked with racing motor cyclists, I am not in general one for endless speed limits, I am also very aware of the speed some are doing in my 20 zone a road with pavement on one side and a natural pinch point making it quite narrow, and there is a junior school at one end. None of the above along with the useless bumps that are simply straddled stops people from driving anywhere up to 50 + on a regular basis including vans and trucks and bikes, and we have superbike visitors at weekends who treat it as a challenge and have definitely been doing 70 which is enough in a sane world to have them locked up. Perhaps the reason that they are often ignored, is that they are often indiscriminately applied to roads for which they are not necessary. In so doing, the authorities lessen the impact on their use in areas for which they are appropriate, and add yet more street furniture to distract the driver from maintaining attention to the road and its other users. My local council implemented a very widespread 20 mph limit across much of Bath. Supposedly with the backing of the local population who were consulted on this. Regardless, the 20 mph limits are in force on many roads where there is no real need for the lower limit. The limits are not enforced at all, which makes it so far a seemingly waste of the £0,5M that was spent to introduce this. As a cyclist, I am more concerned about the risk of hitting a pothole / badly fitted manhole cover, and this causing me to crash, or destroy my wheels. 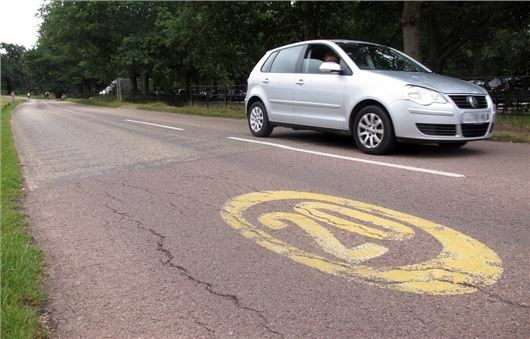 If the 20 mph zones were implemented with more consideration, then most drivers would respect them more. If the 20 mph limits were enforced, there might be a backlash / realisation that in many places these limits are completely unnecessary. I live in a south east London residential suburb, on the edge of a 20mph - I would say 40-50% speeding is about right. I've seen and experienced road rage from drivers who disagree with the speed limit and try to enforce a higher speed with horn and aggressive driving. Drivers regularly hit 35mph, but can't do much more because of the speed humps. But all that pent up resentment can be released when reaching my section of the road and speeds on 50-60mph are not uncommon, even from drivers not speeding in the 20 zone, but who seem to feel 'short changed' and justified in making up the time when they hit the 30mph zone. The Police did a 45 minute speed trap last year, during the Holidays, following my complaints; they stopped several motorists and fined three, then wrote to me saying that they were "confident that this exercise would have sent a clear message to the 'speeding community' of motorists; but alas the speeding motorist grapevine failed spread the news. The council put up a smiley/frowny face sign - but kept no record. - Apparently no clear action would be taken unless a least two people were seriously injured or killed in a two year period. I would like the 20mph zone extended - because at least most people keep to 20 and nearly all keep below 30mph; regular speeds of 50mph in a residential back road is unacceptable. I accept that inappropriate use of 20mph zones out side of residential/retail areas should probably not go ahead and respect campaigns to stop them - but I do not accept the principal of "any speed you want" providing no-one is killed (well maybe one or two). Lets have more places for people to enjoy a bit of speed and keep residential roads safe and quiet please. The biggest problem with any speed limit designed to apply at a particular time of day, is that drivers very quickly become 'blind' to it. This is because drivers know when the school is in use and when it isn't, especially come the Summer holidays. There's little excuse when the speed limit is only advisory and is posted as applying during school hours.however, many of the enforceable speed limits, especially the longstanding 30mph ones, apply 24/7 365 days a year, leading to drivers, especially those who have to drive through the limit frequently, to become blind to it. Why those who produce our motoring laws, are so resistive to the use of variable speed limits, except of late on some motorways as a cheap way to cram more vehicles in, escapes me. Likewise, with the very common zipper sign used to merge lanes and the flashing amber traffic light used during the hours of darkness and minimal traffic across much of Europe. 20 mph limits are imposed reasonably near schools. Powys has closed a number of schools over the past several years, mainly small rural schools in almost unbuilt locations. Years later the 20 mph are still in force to no good purpose whatsoever. 20 mph zones will never be respected unless they are necessary, appropriate and properly managed. I have no problem with 20mph limits being imposed, in suitable areas. Blanket application is resulting in drivers ignoring them when not time limited or covering areas without good reason. Around schools is fine in school hours, at weekend, in school holidays why are they there? In my local road they have been applied the limits, there are 2 schools. Before and after school when children are arriving and leaving it is impossible to travel at more than 10mph. Yet local people insisted the limit was applied. It is about time some one in our government was brave enough to impose additional tests to raise the standard of driving. Why do insurance companies give up to 20 per cent reduction on premiums when a person has an advanced qualification?